Apple’s upcoming iPhone 8 is said to feature a design overhaul, with sources claiming that the device is going to sport a near bezel-less form factor with an extremely high screen-to-body ratio. In addition, the device has been the subject of which display technology it will feature, and we keep jumping on the OLED train every time. Now, the latest report states that Apple has asked Samsung for nearly 70 million OLED displays for the iPhone 8 and possibly for its future models, and looking at South Korean’s production facilities, we’re inclined to say that the manufacturer will be able to deliver the request. Apple is looking to hit a home run with the announcement of its iPhone 8 and the company is also looking to up its production for the September-bound flagship. However, the upcoming phone is expected to transition to the OLED technology, resulting in the handset featuring a vibrant display that will also contribute to an efficient iOS operating system. 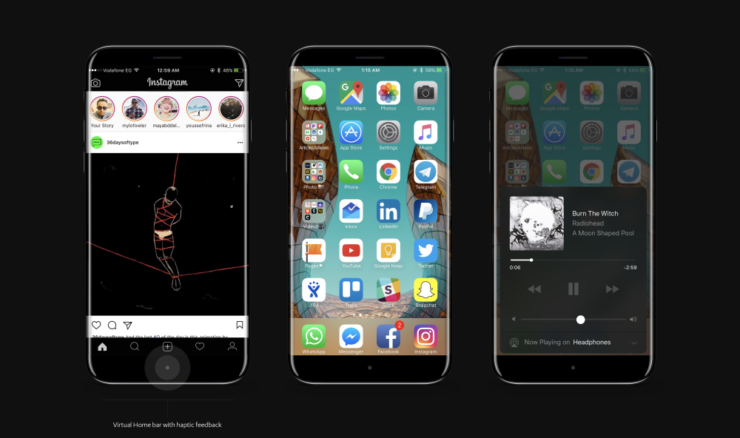 However, Apple is not going to be able to accomplish this without the aid of Samsung and as previous reports have detailed, the Galaxy S8 manufacturer had secured a lucrative $4.3 billion USD deal with Apple for OLED display production. The 70 million figure of OLED panel orders comes from Nikkei, while another IHS analyst by the name of David Hsieh claims that Samsung could prepare up to 95 million OLED units if Apple ever needed them, showing the production capabilities of the Korean manufacturer. The remaining two models, which multiple sources are claiming will be named the iPhone 7s and iPhone 7s Plus are going to feature the traditional LCD screen, but will also provide support for wireless charging. iPhone 8 on other hand has been rumored to look completely different when compared to its previous generation iterations and it could feature the same water-resistance rating as Samsung’s current-gen flagships, which is IP68. How successful do you think Apple’s gamble is going to be when it releases a radically changed iPhone 8? Let us know your thoughts right away.